Catching up on the carpet series? Read Jennifer’s first post about manufacturers, fibers and styles. The details about carpet that I presented in my last post were a “behind-the-scenes” look at the industry. Once you decide your preference of these basics, though, there are still more options to think about! Most trusted brands of carpet stand behind their name, but warranties can be flexible from one manufacturer to the next. Definitely talk about the warranty before you hand over your credit card! Don’t skimp on cushion! There are many styles and thicknesses to choose from. 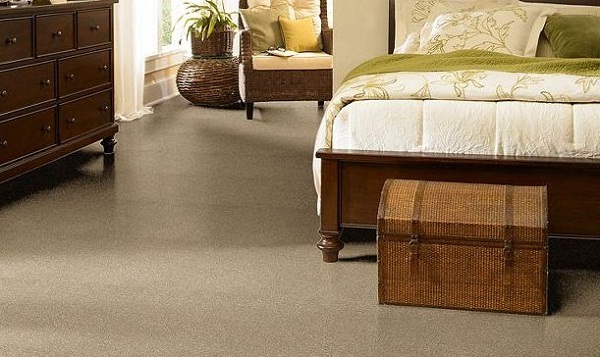 When most people think of a carpet pad, comfort comes to mind, but that doesn’t mean you need to buy the thickest pad available. Make sure you know the suggested thickness for your chosen carpet style. In addition to comfort, the pad provides warmth and helps to buffer sound. Thicknesses range from a quarter of an inch to half an inch. You can now start thinking about color! Wait a minute…is that where you would’ve started before reading all about carpet? Carpet color affects the character of any room, and what we like isn’t always suitable for what we need. Here are a few pointers to keep in mind when selecting that perfect color. Do you have pets or small children? Stay away from light colored carpet, and choose a darker option that will blend in with any accidents. Do you want a modern look? Go with white, black, very dark brown or beige. How about Victorian? Deep reds with patterns will do the trick. What’s your favorite carpet color? The last post in the carpet series will cover the carpet type and colors Betenbough Homes offers in new homes. This information will be featured next week, so be sure to check back!